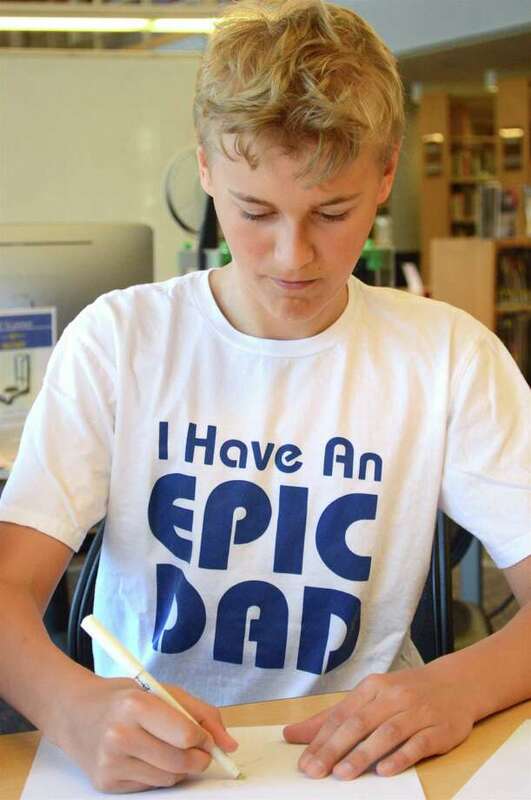 Adam Sabo, 12, of New Canaan, wears a shirt in the spirit of the holiday at the Father's Day tie-making workshop at New Canaan Library on Saturday, June 16, 2018, in New Canaan, Conn.
NEW CANAAN — “The library has so much stuff to do,” commented Adam Sabo, 12, of New Canaan. Saturday afternoon’s Father’s Day craft event confirmed it. Kids enjoyed crafted tie-shaped bookmarks at The New Canaan Library’s Maker Lab. “It’s really a great opportunity to come and use the Maker Lab,” said Laura Miller, digital services librarian. She guided participants through a range of assembly techniques, including the use of thermography. “They’re getting to explore the equipment we have, but also making something for somebody they love,” Miller said.